Lombardy, the richest region of Italy, features magnificent lakes, Alps, and modern cities like Milan, Pavia, Cremona, and Mantova. Lombardy, Italy’s richest and most developed region, often seems to have more in common with its northern European neighbours than with the rest of Italy. Given its history, this is hardly surprising: it was ruled for almost two centuries by the French and Austrians and takes its name from the northern Lombards, who invaded the region and ousted the Romans. 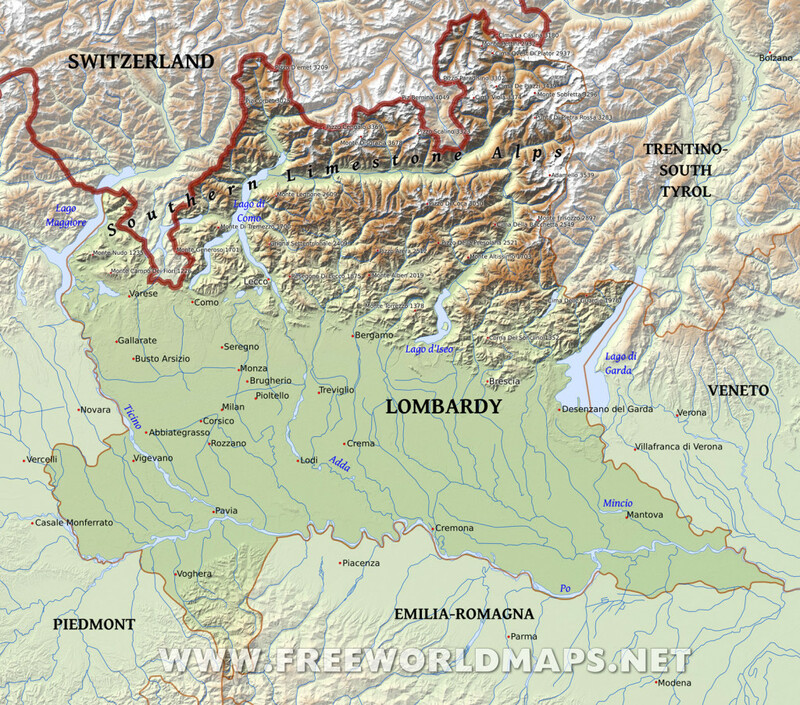 As a border region, accessible through numerous mountain passes, Lombardy has always been vulnerable to invasion, just as it has always profited by being a commercial crossroads. It was long viewed by northerners as the capital of Italy – emperors from Charlemagne to Napoleon came to Lombardy to be crowned king – and northern European business magnates continue to take Lombardy’s capital, Milan, more seriously than Rome, the region’s big businesses and banks wielding political as well as economic power across the nation. The region’s landscape has paid the price for economic success: industry chokes the peripheries of towns, sprawls across the Po plain in the south, and even spreads its polluting tentacles into the northern lakes and mountain valleys. Nonetheless Lombardy has its attractions: the upper reaches of its valleys are largely unspoilt; its towns and cities all retain wanderable medieval cores; and the stunning scenery and lush vegetation of the lakes make it easy to forget that the water is not sparkling clean. As for Lombardy’s people, from the cossetted residents of the provincial towns to Milan’s workaholics, they hardly fit the popular image of Italians. In fact, they don’t have much time for a substantial proportion of their compatriots: urban northerners are rather dismissive of the south, derisive of Rome and historically all too ready to exploit the so-called terroni (literally earth-people) – a highly insulting term for southern Italians who leave their poverty-stricken villages to find work in the north. Milan, a natural gateway to the region, and where you may well arrive, dominates the plain that forms the southern part of Lombardy. The towns across here – Pavia, Cremona, Mantua – flourished during the Middle Ages and Renaissance, and retain their historical character today, albeit encircled by burgeoning suburbs. To the north, Lombardy is quite different, the lakes and low mountains of the edge of the Alps sheltering fewer historic towns, though Bergamo and Brescia are notable exceptions. This has long been popular tourist territory, particularly around the lakes of Maggiore, Como and Garda, and wealthy Italian holiday-makers and day-trippers are much in evidence. Although the western shore of Lago Maggiore and the eastern and northern shores of Lago di Garda are, strictly speaking, in Piemonte, Veneto and Trentino respectively, the lakes region and all its resorts are all covered in this section. The first ever guide to this area gets to grips with Milan, international mecca of fashion and shopping, with its awesome art collections and world-famous La Scala opera house. The economic powerhouse of Italy since the Middle Ages, Milan is today a vibrant, frenetic city and Cadogan’s discerning listings seek out the best bars, restaurants and clubs in which to party with the locals. But Lombardy has its gentle side too, and this guide reveals idylls along the shores of the famous Italian Lakes, such as the palms, lemon groves, and castles surrounding Lake Garda, and winds through the Renaissance cities of the Lombard plain. Admire the Gonzaga frescoes of Mantua and visit the refined art city of Bergamo, perched on a promontory on the edge of the Alps. The beauty of the area is illustrated in stunning color photographs, and full travel and practical information will make anyone’s stay as dreamy as the scenery.